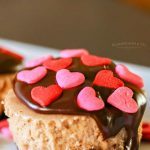 Nutella Mini Cheesecakes are easy chocolate cheesecake recipe topped with Kahlua ganache that is perfect for celebrating Valentine’s Day with your sweetie. Valentine’s Day is almost here. So I have one more simple little Valentine goodie to share with you all today. I have been promising the hubs that I would make him more mini cheesecakes since I created my Patriotic Mini Cheesecakes back during 4th of July. Yes I have really been putting him off on this one. 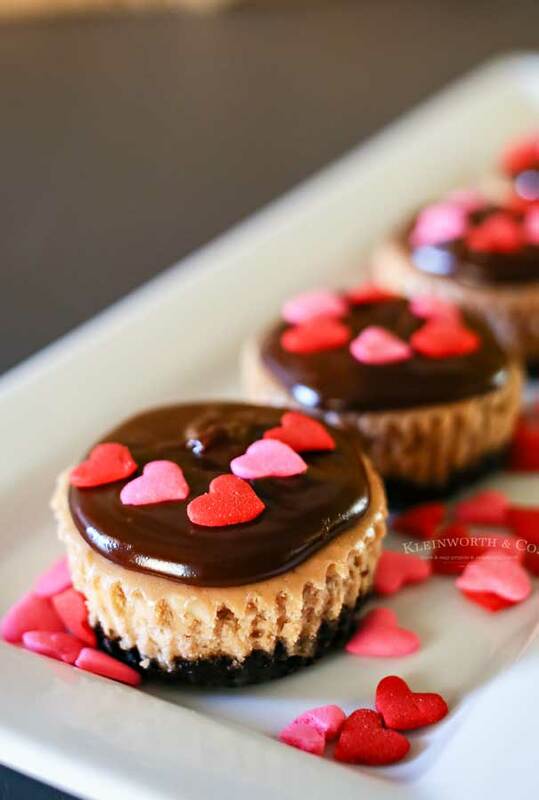 So for Valentine’s Day, I decided to surprise him with these yummy little mini cheesecakes twisted with Nutella, Oreo crust & topped with Kahlua ganache. Hubs sure loves having these in the house. Cheesecake is a favorite for him! Like when I say favorite – he will take cheesecake above all other treats- hands down. So then I make it with an Oreo crust & load the cheesecake itself with Nutella & he’s hooked. It put him over the top when I added that Kahlua ganache & pretty heart sprinkles. Yep- I may have made the wife of the year in his book. He’s one happy guy. 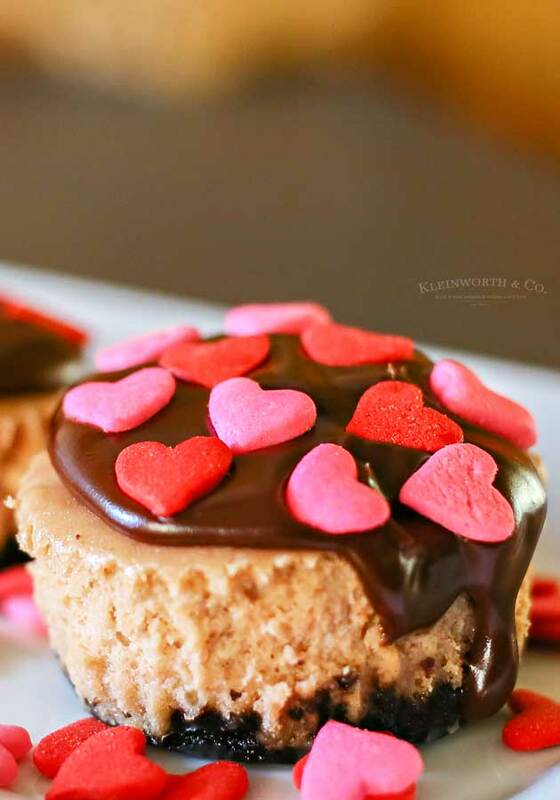 Can these cheesecakes be made ahead of time? Yes. I really like to bake these in bulk and then store them in the freezer. Then whenever I get a craving for cheesecake, I can thaw just one or two, making it perfect for the hubs & I when the kids aren’t here. 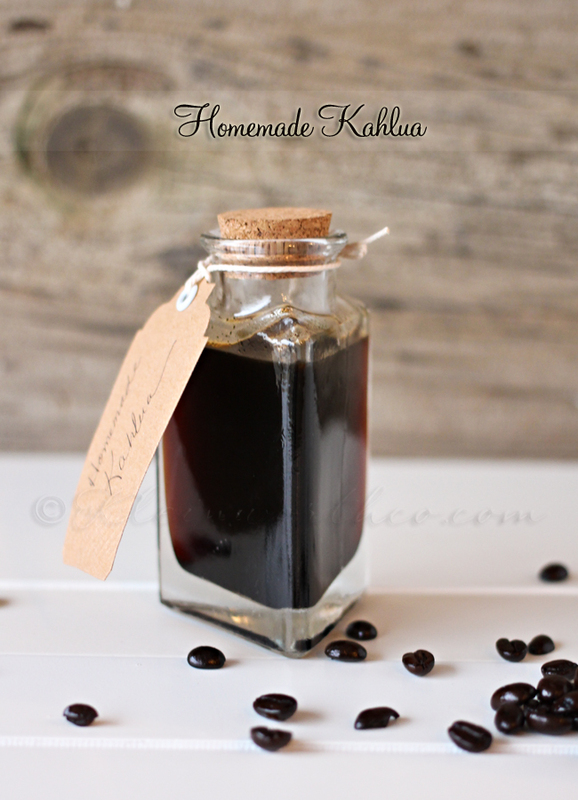 How do you make the Kahlua ganache? Place all ingredients in medium saucepan & heat on medium. Whisk to combine ingredients until it is all completely melted & combined to a thick silky consistency. DO NOT allow to boil. Remove from heat & allow to cool to room temperature before you drizzle over your cheesecake. Store remaining ganache in an airtight container in the refrigerator for up to 1 week. 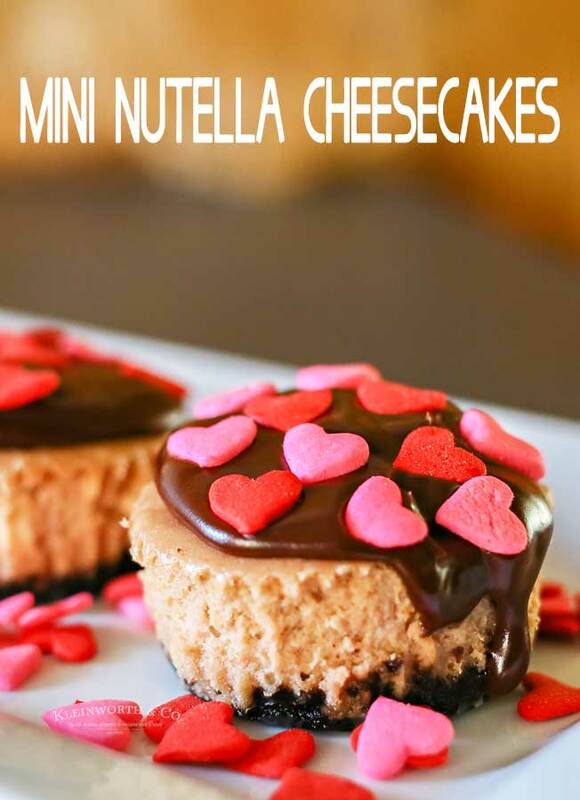 HOW DO YOU MAKE Nutella Mini Cheesecakes? Add Oreos, melted butter & 2 tbsp sugar to food processor. Pulse until you have a paste-like crumb mixture. Line 18-24 muffin tins with cupcake papers. Spoon about 1 tbsp of Oreo crumb mix into the bottom of each wrapper & press down to flatten. Beat cream cheese in a mixer to soften. Add remaining sugar, vanilla & Nutella & beat until combined. Add eggs – one at a time- mixing on low just until blended after each one. Spoon over each crust in liners – should fill approx 3/4 full. Bake 25-30 minutes or until centers are almost set. Transfer to refrigerator to cool & set at least 2 hours. Top with Kahlua Ganache & sprinkles. 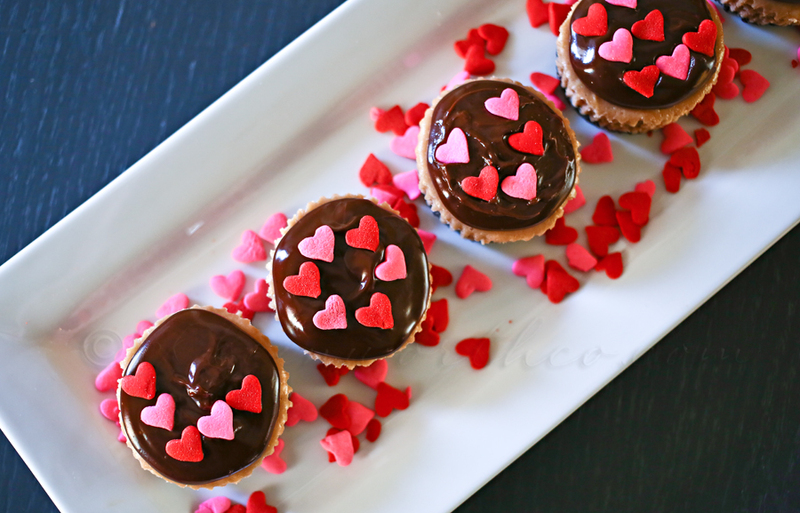 I added the heart sprinkles – making out the word LOVE (can you see it?) with a heart explosion at the end 🙂 So cute! I love making food into words for holidays like this. These are positively scrumptious – no matter the holiday. Add Oreos (about 10) melted butter & 2 tbsp sugar to food processor. Pulse until you have a paste like crumb mixture. Add eggs - one at a time- mixing on low just until blended after each one. Whisk to combine ingredients until it is all completely melted & combined to a thick silky consistency. DO NOT allow to boil. Remove from heat & allow to cool to room temperature before you drizzle over your cheesecake. I love cheesecake! These look wonderful! And festive! Yummy! I love chocolate!! I’ve followed you via twitter, pinterest, and Google Plus 😉 I found your blog from “Work It Wednesday” Hop. 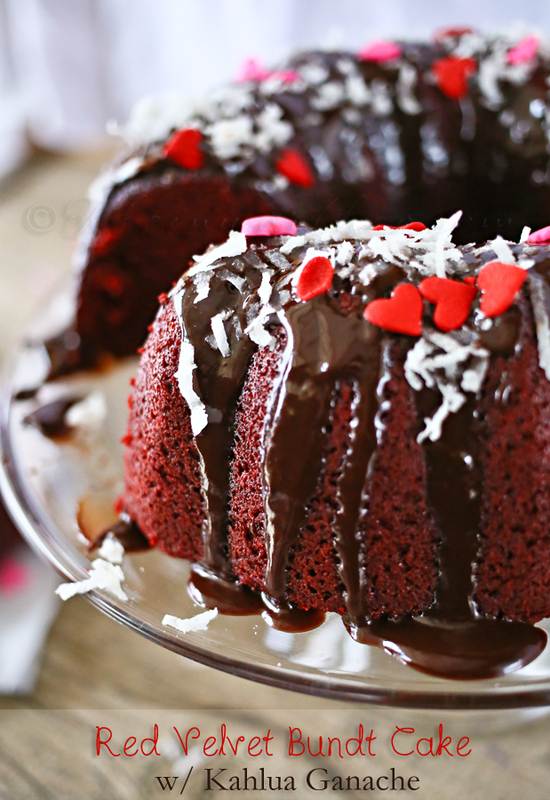 Mmm who wouldn’t love one of these on Valentine’s Day! 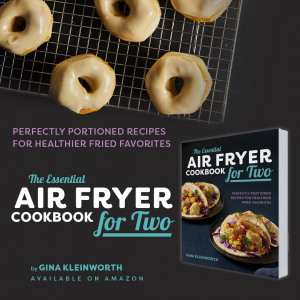 Oh man – those look amazing! Awesome. They look amazing. I found you through the linkup and I just have to say your photography is gorgeous! These are BEAUTIFUL!!! I can’t wait to give them a try! These are too cute! I look forward to giving them a shot! I love Nutella, I’ll have to try this. I never made anything using Nutella…this will be a good start! Making this tonight!! Yummo!! I mean, what could wrong itch Nutella and Oreos?! These look incredible, so pretty and festive! 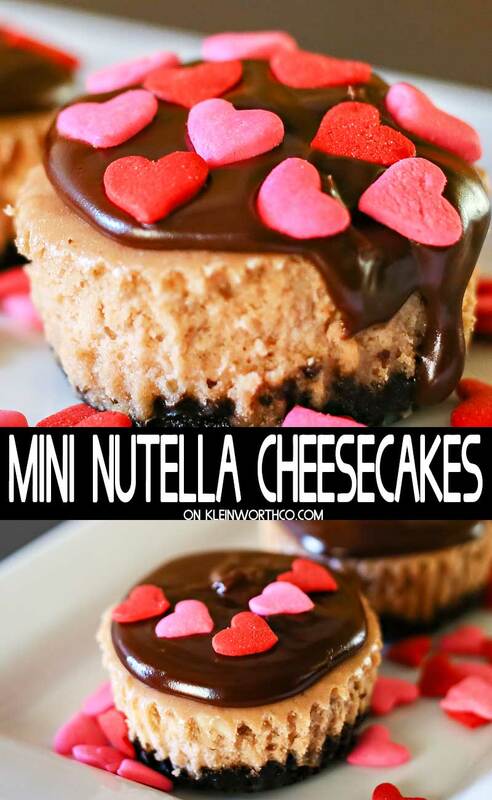 Nutella and cheesecake sounds amazing too! 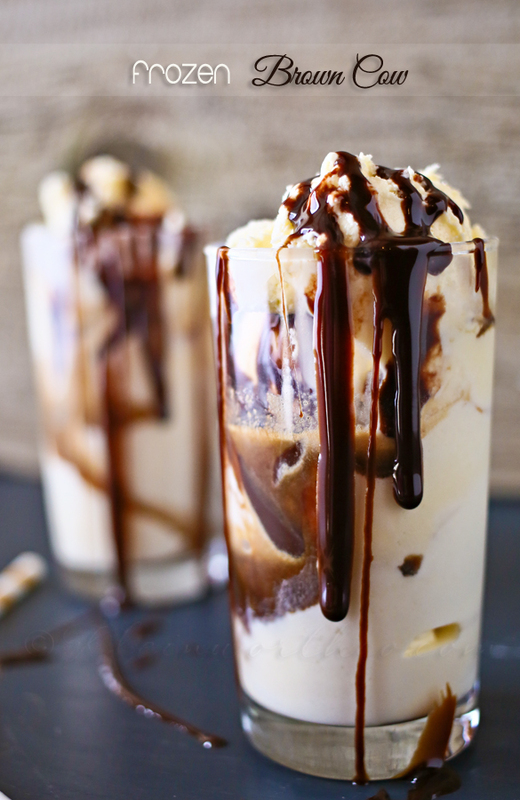 This looks delicious!! I have a box of Trader Joe’s gluten free oreo cookies here so this would be easy to convert to gluten free. Thanks for sharing! I bet he was happy…sounds like a very posh cheesecake! 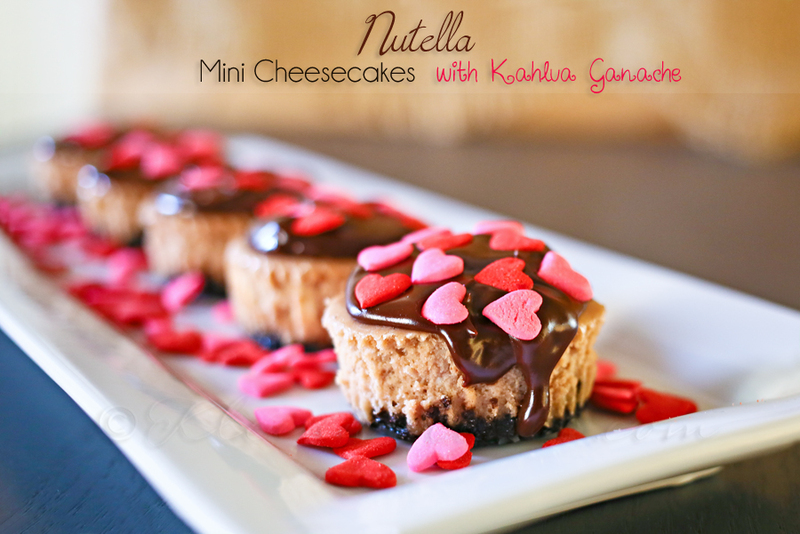 Oh I just love cheesecake and these sounded amazing before I even read “kahlua ganache”.. now they sound even better!! Pinning! Can you freeze the cheesecakes with the ganache or just the cakes? Thanks. Hi Dani, I wouldn’t recommend it. They are best when frozen prior to decorating.